June M. Crowell – Our sweet mom, grandma, sister, godmother, and friend June Marie Crowell passed away March 15, 2019 surrounded by her loved ones due to complications of a stroke. She was the young age of 86! June was born to Wilbur and Marie Breshears Steagall on August 27, 1932 at Heppner. She was the oldest of eight children. June attended and graduated from St. Joseph’s Academy, Pendleton, Oregon, with the class of 1950. She married Howard Crowell on November 12, 1951. Together they had 3 children and made their home in Ione. She began her banking career with First National Bank before moving on and eventually retiring from managing the Bank of Eastern Oregon Ione Branch. June was involved in the American Legion Auxiliary, Willows Grange, St. Williams Altar Society, Topic Club, Card Club, Good Neighbor Club, City Recorder, Booster Club, 4-H sewing leader, among others. She was honored to receive the 2002 Woman of the Year by Heppner Chamber of Commerce. Although she was busy with her clubs, she always made time for her hobbies and interests which included square dancing with her husband, sewing blankets for her grandchildren or patching up their britches!! She spent her days and evenings in her garden, having coffee or sipping ice tea on the patio with her family and friends and throwing the occasional apricot over the fence. 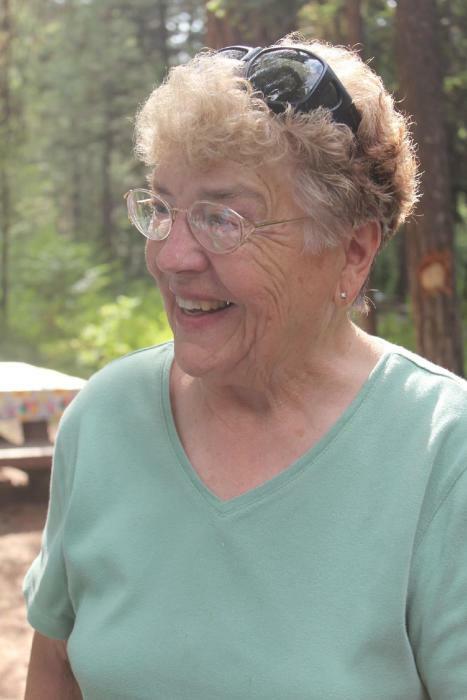 She was always up for a game of Scrabble or Mexican Train and cherished her time with those playing with her. There were two annual events that the world stopped for and that was for her Mother’s Day weekend with her sisters, and the family reunion at Bull Prairie. June is survived by her children; Gene (Kristy) Crowell, Ione, OR., Karen Kandle, Vernal, UT., and Sharon (Brian) Rietmann, Ione, OR. She has also left behind ten adoring grandchildren and 16 great grandchildren, siblings; Bob (Beverly) Steagall, Bill (Margie) Steagall, Deanna Brandhagen, Patricia Dougherty, Barbara (Greg) Leyva, and Jim (Loel) Steagall. She is preceded in death by her parents, loving husband Howard, infant brother Charles Thomas Steagall, son-in-law Rick Kandle and many grandparents and in-laws. If your heart desires and you would like to donate to a charity, June would appreciate donations in her memory be made to any organization that would benefit Veterans or Children. A viewing will be held on Friday March 22nd from 4:00-6:00 p.m. at Sweeney Mortuary in Heppner, OR. A Rosary will be said on Friday, March 22, 2019 at 7:00 PM, at St. Williams Catholic Church, Ione, OR. Funeral services will begin at 11:00 AM Saturday, March 23, 2019 at St. Patrick’s Catholic Church, Heppner, OR. A reception will immediately follow her service at St. Patrick’s Parish Hall. Burial will follow at 3 p.m. at High View Cemetery in Ione, OR.